You’ll be amazed when you try one of our entrees from the kitchen. It is an experience that is sure to please. Our Executive Chef Efren Rendon has over 30 years in the restaurant industry, including two years here at Grille 54. He previously worked with The Ritz-Carlton Hotel Chain. Allow Efren to prepare you one of our hand cut steaks (Filet, NY Strip, Ribeye) or his signature Eggplant Tier Appetizer. We offer a full bar boasting 100 wines by the bottle, 25 by the glass, 40 beers, and 15 Specialty Cocktails. Please feel free to ask us about our nightly Happy Hour (4:00 - 6:30) and our weekly specials! Whether celebrating a special occasion with family and friends or hosting a corporate outing, Grille 54 - Citrus Park can accommodate all your special event needs. An oven baked loaf of French bread filled with butter, spinach, garlic, and Parmesan cheese. Served with our house red sauce for dipping! Crispy chicken tossed with buffalo sauce and Asian slaw, dressed with blue cheese sauce & sweet Thai sauce. Maine lobster meat, corn, avocado, adobo mayo & Napa cabbage with a green tomato salsa. New England Style lobster roll. Fresh cooked lobster meat, tossed with mayonnaise, celery, & onions served on grilled mini buns. Oven baked homemade Italian bread stuffed with pepperoni. Served with a side of Alfredo cheese sauce. Bacon wrapped, wood-grilled, and served with honey- jalapeño sauce. Sausage & Parmesan served with marinara sauce & buffalo chicken with a spicy mascarpone cheese sauce. Rare beef tenderloin pounded paper thin, topped with arugula, capers, shaved Parmesan, and extra-virgin olive oil served with baked crostinis. Traditional Italian hand-rolled meatballs topped with authentic Italian tomato sauce & sweet mascarpone cheese. 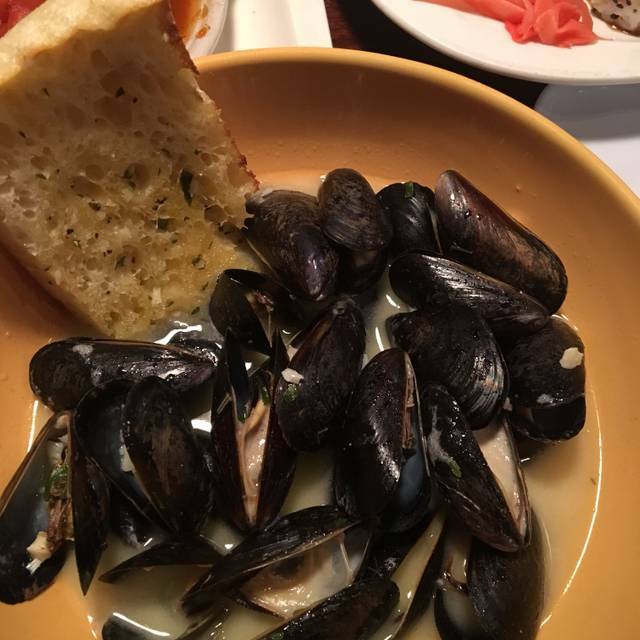 Simmered in garlic-thyme butter and served with freshly baked crostinis. Creamy artisan cheese blended with Maine Lobster and fresh spinach served with homemade tortilla points. Breaded eggplant layered with mozzarella, tomatoes, arugula, & fresh basil. Topped with shaved Parmesan then drizzled with extra-virgin olive & aged balsamic vinegar. (Served hot or cold). Sriracha marinated chicken skewers, grilled, and served over Asian slaw. Dusted calamari flash-fried and served with spicy marinara sauce. Try it Roberto Style: topped with a sweet and spicy mixture of peppers & vinegar and served with a Sweet Pepper aioli. As authentic as you can get. Seasoned jumbo lump Maryland Blue Crab meat served with a garlic aioli. A daily selection of homemade soup by our chef. Fresh snow crab in a rich sherry cream bisque. Our version of the French classic. With balsamic grilled filet tips, assorted field greens, goat cheese medallion, red bell peppers, mandarin oranges, red onions, & roasted pine nuts. Served with raspberry-walnut vinaigrette. Crisp greens, avocado, tomatoes, bleu cheese, roasted pine nuts, smoked bacon, egg, and garlic-roasted croutons. Topped with wood-grilled chicken and served with a citrus-herb vinaigrette. Fresh Maine lobster meat, roasted corn, diced tomato, & smoked bacon dressed with our spicy-creamy Italian dressing. Fresh Iceberg with tomatoes, cucumbers, Kalamata olives, pepperoncinis, red onions, and feta cheese served with our signature Greek vinaigrette. All topped with wood-grilled chicken. Romaine lettuce, Parmesan, and garlic-roasted croutons tossed in our homemade Caesar dressing and topped with wood-grilled chicken. Tossed in a rich Parmesan cream sauce topped with a wood-grilled chicken breast. With seasoned meats and cheese. Topped with our house red sauce. Al dente pasta served with our homemade meatballs, sausage, and fresh chopped tomatoes, all topped with mozzarella and baked in a piping hot cast-iron skillet. Served with Gorgonzola cheese sauce, Italian ham & fresh peas. Chicken breast stuffed with ham, Swiss & Cheddar cheeses, breaded and pan seared topped with Alfredo sauce. Served with mashed potatoes and vegetable of the day. 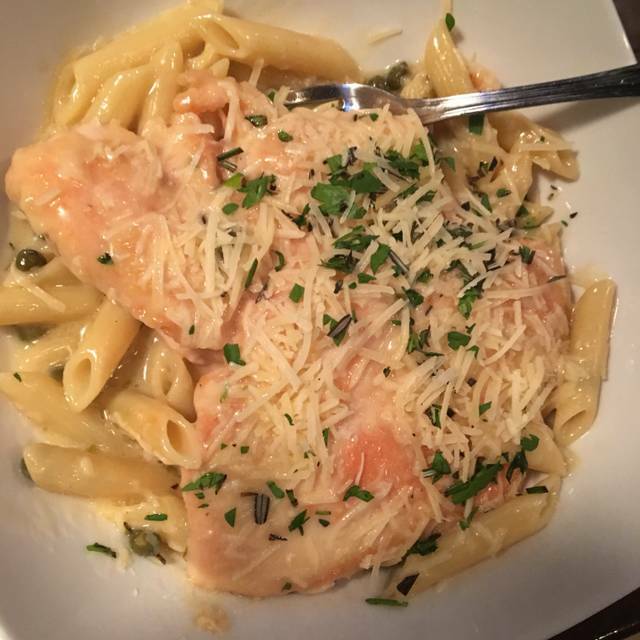 Sautéed with capers and lemon-butter sauce served on a bed of pasta. Veal scallopini with asparagus, artichokes, tomatoes, and pine nuts served over mascarpone polenta served in a white wine butter sauce. No substitutions, please. Chilean Seabass served over whipped garlic mash potatoes layered with tender spinach topped with piccata sauce. Sautéed Maine Lobster served in a truffled Romano butter with fresh basil and thyme. Topped with mozzarella and our house red sauce, served with a side of pasta of the day. Eggplant Parmesan and grilled chicken breast topped with spinach cream sauce and mozzarella cheese. Served with pasta of the day. Chicken scallopini, crisp prosciutto, and fresh sage with a cognac cream demi glaze all resting on roasted garlic puree and a bed of greens. Finished with baked mozzarella. Linguine topped with lobster, shrimp, and scallops, in a spicy red sauce. Make it risotto style. Grilled pork medallions served with truffle mash potatoes in a porcini mushroom brandy cream sauce with broccoli, red peppers & corn. All dishes are cooked on our oak burning wood-fired grill. Add soup, house, Caesar or wedge salad. 10oz burger cooked to temperature. Topped with Gouda cheese, prosciutto, onion rings and Kalamata olive aioli. Served with house cut black truffle fries. Blackened Mahi Mahi with roasted vegetable rice, asparagus spears & honey jalapeño sauce. Served with eggplant fries & smoke gouda stuffed tater tots, topped with lemon ginger butter sauce. Wood grilled fresh salmon served with vegetable couscous & broccoli spears. Accompanied with our saffron beurre blanc sauce. 12 oz NY Strip topped with tomato Brushcetta and balsamic glaze. Served with a side of chorizo and smoked gouda mac & cheese. 6oz filet with béarnaise sauce and port wine syrup with Lobster Mac. ADD 2oz or 4oz. 10 oz sirloin served with asparagus spears and gorgonzola demi. Accompanied by a bleu cheese, spinach and mushroom risotto. ADD A Maine Lobster Tail. Twin wood-grilled chicken breasts topped with a spinach-cream sauce with mozzarella and diced tomato baked on top. Served with broccoli & garlic mashed potatoes. Make it pasta style. Fresh blend of Italian meats & herbs, wood grilled to perfection and topped with fresh mozzarella & crispy prosciutto. Served on a toasted Kaiser roll with garlic aioli, a side of marinara, and house-cut Parmesan garlic-butter fries. Wood-grilled chicken breast topped with goat cheese, oven roasted tomatoes, and artichoke hearts all drizzled with a balsamic glaze. 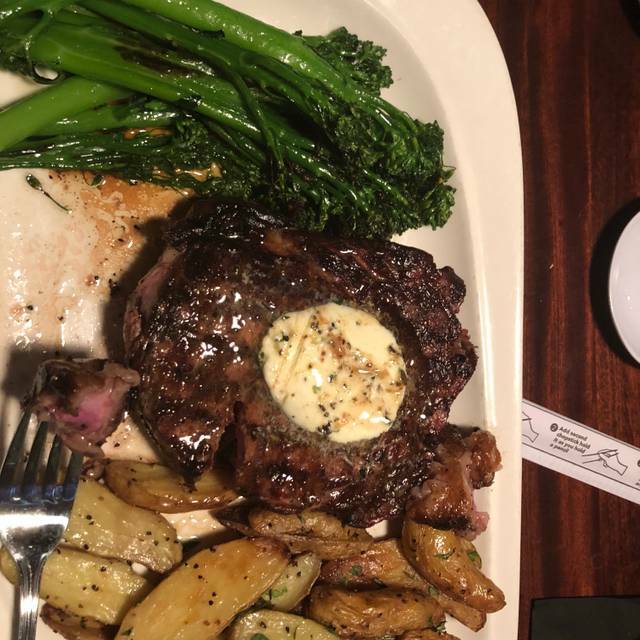 14oz ribeye with gorgonzola au gratin potatoes & broccoli served with gorgonzola demi. Make it a "King Seafood Ribeye" ADD ½ Maine Lobster Tail, Jumbo Scallop and Shrimp covered in a Scampi Sauce. Exceeded our expectations! Food and service was amazing! We always have great meals here, and tonight was no exception. That said, our service tonight was far from typical. We were sitting at a high top table on the bar side, and I am guessing our server had tables on the other side of the restaurant. Our drinks were empty on several occasions for longer than what two members of our party deemed acceptable (they are also in the service industry). I am certain he would have preferred increasing our tab with additional beverages from the bar, but I think he just couldn't get to us. 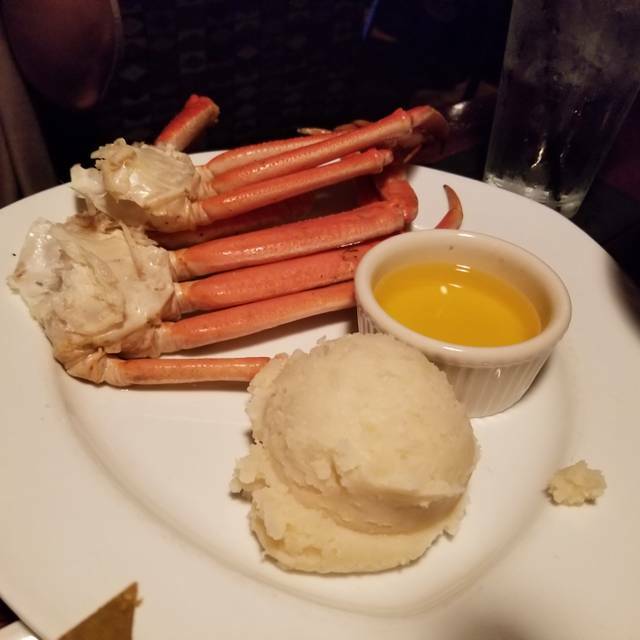 I did notice many of the tables around were eating crab legs, so I think there was a crab leg promotion may have contributed to the servers being so busy. We went for the Sunday brunch. For the price, the food was mediocre and some of it was cold. I would not recommend it. An incredible steak! Be aware these are LARGE pieces of meat. You could easily split one for 2 people. Interesting sides - no baked potatoes here - roasted brussel sprouts, mashed sweet potato, and so on. Happy hour til 6:30pm with 9 oz wines and perfect martinis. 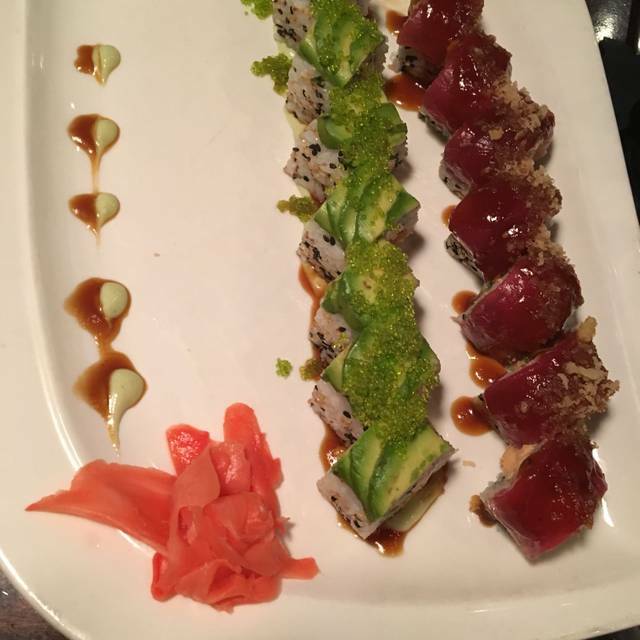 Our overall experience was good, our server I feel like with very spread out through the whole restaurant. It was very hard to get his attention for drink refills. When I went to the restroom I saw that he was working clear on the other side of the restaurant as well. But he was very sweet. Brunch was amazing. Wonderful as always! The food is always exactly the same and the steaks are cooked the way you order. Took a while to be seated after having reservations, but it’s understandable on Valentine’s Day. Was sat at the specific booth I requested which I was very happy about and our server Nick was amazing, excellent service, delicious food. We arrived at 7:30 for a 7:45 reservation and were not seated until 8:40. After being seated we waited 20 minutes to be recognized by a waiter. After ordering drinks our waiter disappeared for 25 minutes before finally showing up with our drink order. We waited another 15 to 20 minutes before our meal was finally served. The food was well prepared and very tasty but the overall dining experience was not pleasant. I definitely would not recommend this restaurant. Let me start off by noting that this was for Valentines Day so everything is crowded and busy. We had reservations for 7:30, arrived right on time but didn’t get seated until 8:00. I noticed one booth that had emptied that didn’t get bussed for 10+ minutes. Seating could have been faster if the bussing staff was on their game. Once seated we had a fairly long delay before our server showed up. That was the last wait as the remain8 g service was prompt. The V Day menu was limited. My wife had the grilled salmon and I had the ribeye. Both were perfectly cooked. The ribeye was huge. Ended up taking half of it home. My grilled asparagus tasted delicious but were unevenly cooked - some overdone while most were right on. The ribeye had a great crust from the grill. I would have preferred pre-seasoning as the flavor was unremarkable. A little salt and pepper took care of that. I went here on a Valentine’s Day with my girlfriend. We got placed at a shaky makeshift coffee table all the way by the back exit. Hey, it’s a popular night, I get it, so I got past that. Our server was horrendous. It took him 20 minutes to bring our first drink order (two glasses of wine), and that’s after I had to walk over and tell the hostess about it. We ordered two appetizers and meals. The appetizers never came, just the main course. Then my girl waited another 25 minutes for her second glass of wine, and I again had to flag someone else down. Fortunately they comped me for one entree and one glass of wine, and gave me a second glass on the house. The entrees themselves were quite good, which almost saved an otherwise poor experience. Amazing food shared with my valentine!! Went this Valentine's Day on a Thursday. I understand restaurants are busy on that day, but not anymore crowded than a weekend night. The restaurant had a limited menu, so I'd think getting food out wouldn't take 1 hour to get served. The actual problem was that we ordered an appetizer that never came out (computer error) and that delayed our food. Other people around us were equally dissatisfied with there delay. The was still good. We were offered a comp drink and an apology. We went in for Valentine’s Day and sat in the room at the back. The music was not too loud and it was not very busy at the time we went so it was quiet. 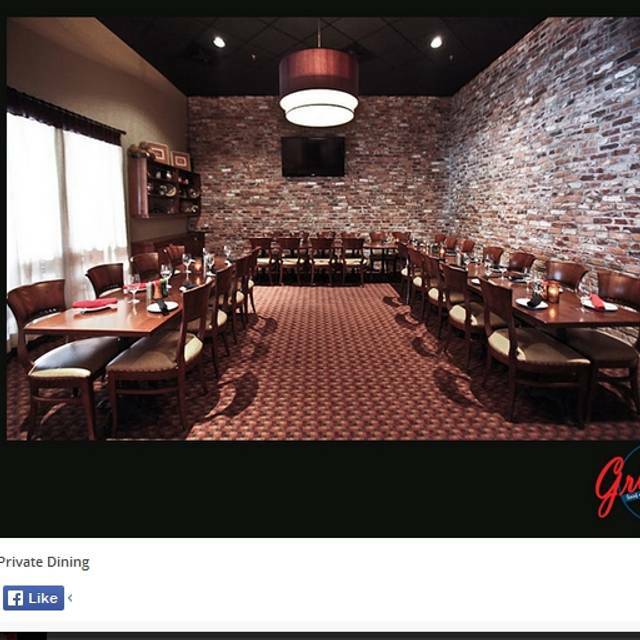 The service was very good and the food was very good as well. They had a special Valentines menu which we ordered from. We were very pleased with the whole experience. Staff and selection of food was awesome!!!! The variety of food items was incredible!!!! I definitely will be returning to Grill 54 for brunch and recommending this restaurant to my close friends and family!!! Knowledgeable waiter; friendly !! Great food !! We always enjoy coming here for dinner. Our servers were amazing and the food was even better. We always get edamame and/or spinach bread for an appetizer which are hard to chose between honestly. I had the seared scallops and lobster risotto which is my favorite. My husband had the chickem cor don blue (sorry for the spelling of that one) which might be his new favorite. My father had chicken piccata which he loved and hes a picky soul. 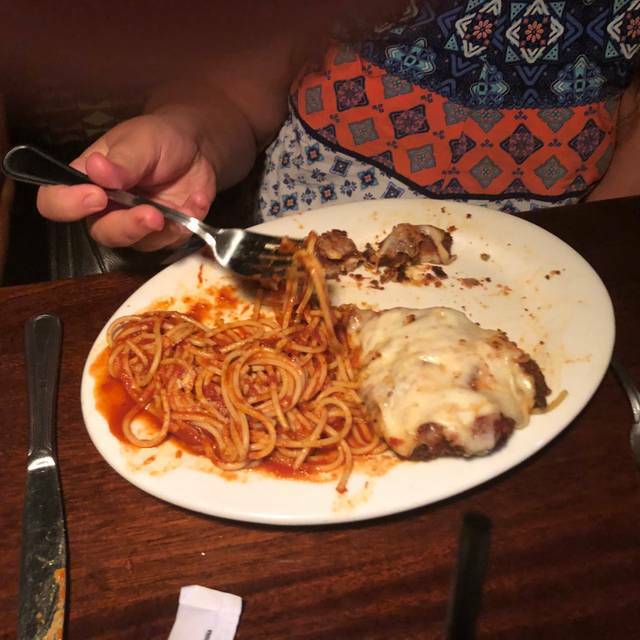 My kids shared a huge piece of lasagna and loved every bite of it. 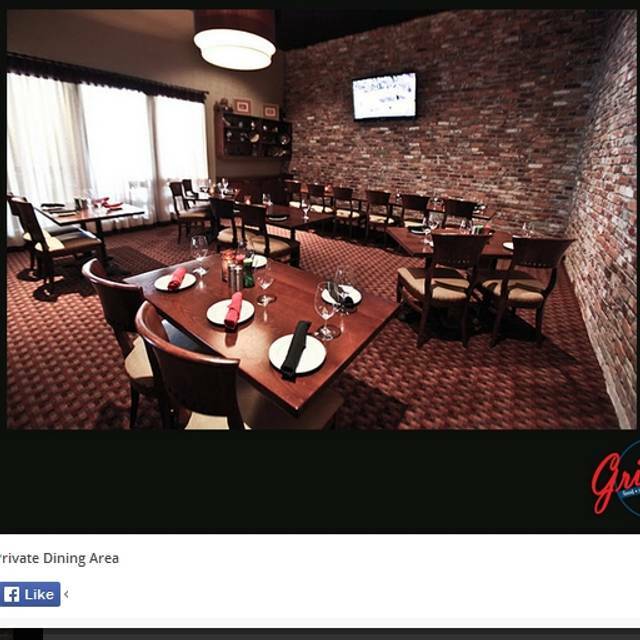 We highly recommend Grille 54. So i tried to redeem a $10 gift certificate, i cashed in my dining points, through this restaurant and i was told by the manager Chris, that they don't take Opentable. Yet Opentable is there reservation system, and since they don't know how to process the point redemption to reflect on the final bill, they just refuse to accept it. Horrible service, never going back. I made a reservation for 12:30 but didn't get seated until 12:55, which wasn't a big problem, we realized that the brunch was over at 2:30 which still wouldn't have been a big deal except they stopped putting food out at 1:45. By the time we left which was 2:15 there was absolutely nothing left. When we got there there was plenty of food, but after the first visit to the buffet, there were empty containers that never got refilled. we asked for certain things only to be told they were out of it. If you go get there by 11 or 11:30. Most people just eat slow and sit and talk that is what we planned on doing but I was very disappointed with the fact that the buffet doesn't end at 2:30 it ends at 1:45. Another great evening at Grille 54! The scallops were the best I've ever tasted; and the service was perfect as usual. We specifically went for the all you can eat crab legs. Their "process" was unable to keep up with 4 people. Each person was able to finish the crabs in minutes, but would take like 8 to 10 minutes if not longer to get more. They should have these just coming to the table. Also, got the pork chop great flavor, but VERY under cooked (raw in the middle). Most of the sides were ice cold. Disappointed. Steak was not cooked properly so it had to go back. No apologies or accommodations were made for the inconvenience. We ate our vegetables before the steak came out so they would not get cold. I go for Holiday dinners with 30+ and I go for Brunch on the weekend. Because it's far for me, I don't go as often as I'd like, but every drive is worth it in the end. Staff is always pleasant and friendly. Sometimes I just want to make them sit and eat with us. Damn good margaritas too! Food was great. Noise level could have been lower, the music was loud. We actually, didn’t bother to order. We came in, and there was an awful odor from somewhere in the restaurant, the seats were worn out, the maitre’d gave us only one menu for the 4 of us, and the food list was not for a special occasion, as New Year’s Eve, so we just left in haste! As we were driving out of the parking lot, this heavy-set guy who seemed to have followed us, was glaring at us, somewhat threateningly. Not a good experience for all. Definitely how they were rated by others! For the price of the buffet Brunch, you’re really getting your money worth! I left satisfied and would definitely revisit again. The food was good ,but they ran out of toilet paper in the Women's bathroom. The food was not good at all. And we were there for almost 3 hours. It was horrible. We will never go back. Limited items for Christmas menu; I was expecting the regular menu to be served as well, still quite delicious. Server was very attentive catering to everyone's needs. Atmosphere is very warm and inviting and decorated nicely. I was very impressed upon my first (and not last) visit! Excellent atmosphere and food. We went to this restaurant on Christmas day before the movie and it was open. 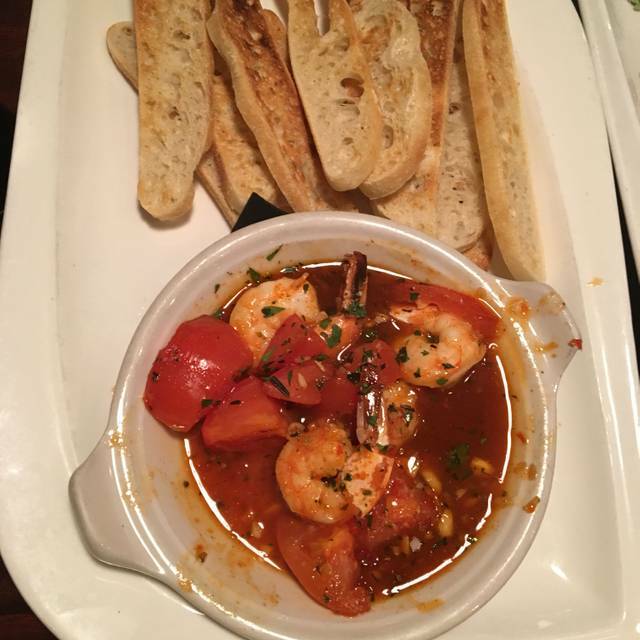 The food was very good and the service was quick and friendly. Service was good though our waiter was nice just wasn’t super knowledgeable on the menu. The ribeye was not tender and medium came out rare which was disappointing. Otherwise the rest of my party liked their selection. We had brunch - it was amazing. Great food, great service and they had a great live guitarist/singer. We have been several times for brunch and they always do a fantastic job. We went on Thanksgiving day and our reservation was for 4:30pm. Needless to say, they ran out of Turkey and basically the only meat left was prime rib. By the time we finished eating our main course, they ran out dessert which was part of the package. I was going to ask that my bill be adjusted, but out server was able to secure a piece of chocolate cake that they serve during regular service. It was delicious and appreciated. Whenever am visiting my kids I Hudson Florida we make sure we have brunch at Grill 54. the food is always great and my husband and kids love the seafood. The Servers are always friendly. Mr. Friendly on the omelet station is always a joy to see. We went to Grille 54 for Thanksgiving Brunch. We no family get together this year, my wife and I just didn't want to have a big Thanksgiving dinner with tons of leftovers. Grille 54 was an awesome alternative. The brunch items included the traditional Thanksgiving fare but with the added breakfast and seafood items you will have a huge selection to chose from. And the best part is it all tasted amazing. Then there's ti limitless Mimosas drinks to keep your wife happy. Very nice ambience and certainly we will return.